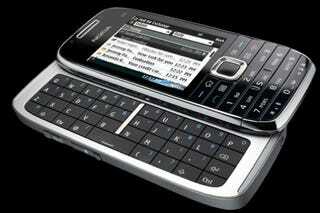 The long-since-leaked E75 has been announced by Nokia, offering bring a new form-factor to Nokia's smartphone lineup. We've known about the E75 since November, but here's the rundown: a 2.4in, 240x320 screen, S60 OS, full 3G capabilities (CDMA and GSM), 3.2-megapixel camera, 4GB of storage with room for expansion via SD, and a 3.5mm headphone jack. Gallery+full spec list below.